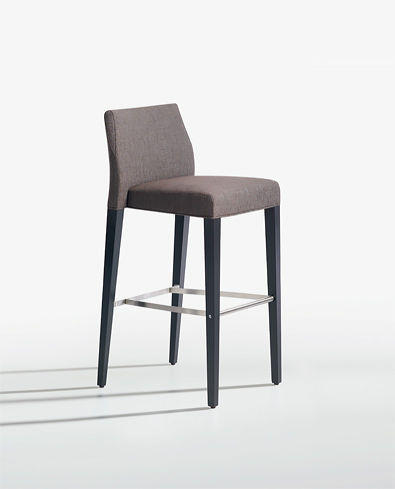 Stool in Beech wood upholstered in fabric or leather, with metal detail foot rest and feet tips, (metal feet tips on bar height version only). 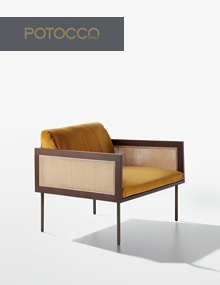 Design: Mauro Lipparini. 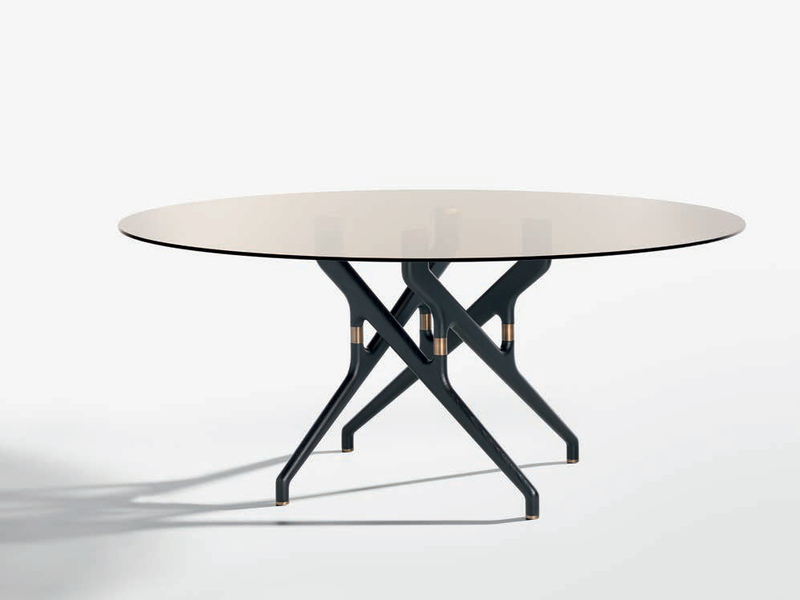 Table with inclined legs mounted on cross base in round extension, and oval extension versions. 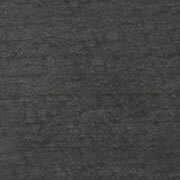 Oak wood in a variety of finishes. 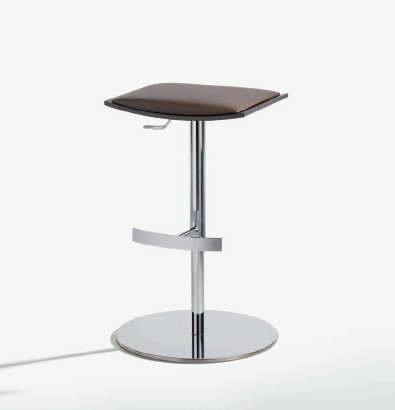 Adjustable height bar stool (gas lift) with beech wood seat upholstered in fabric or leather, with chromed stem, footrest, and circular base. 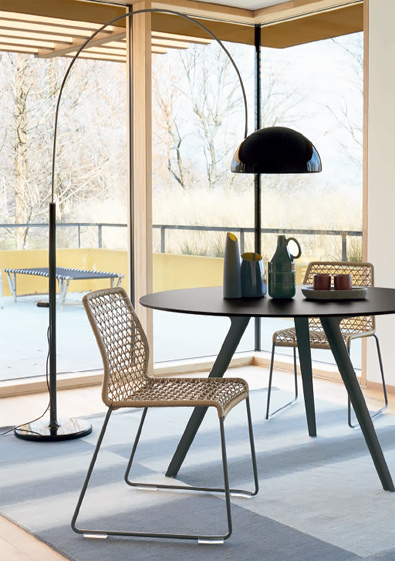 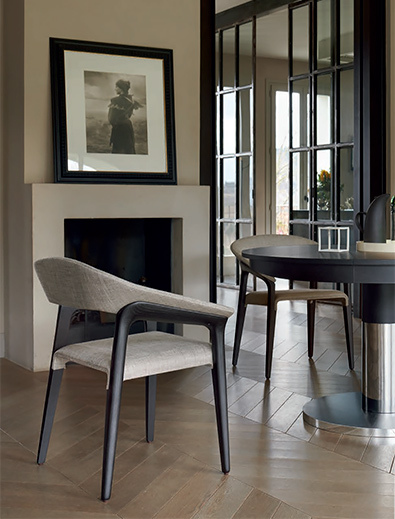 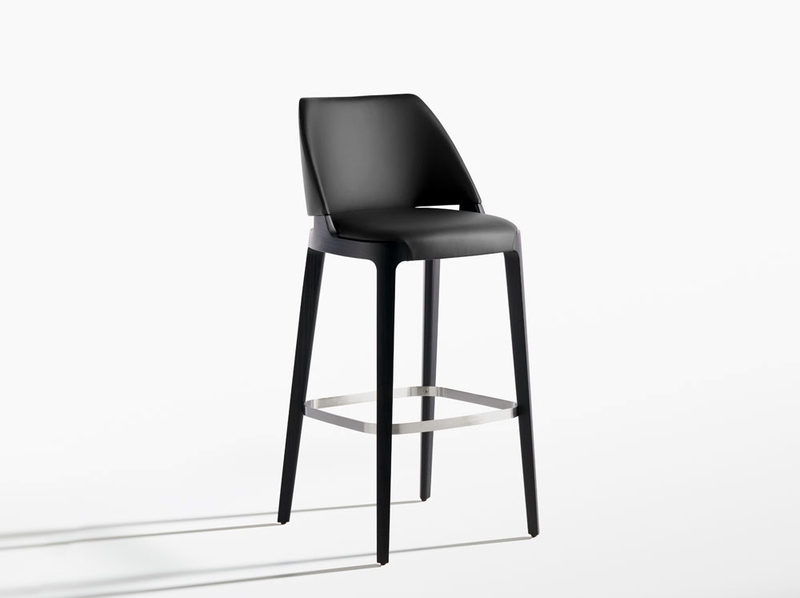 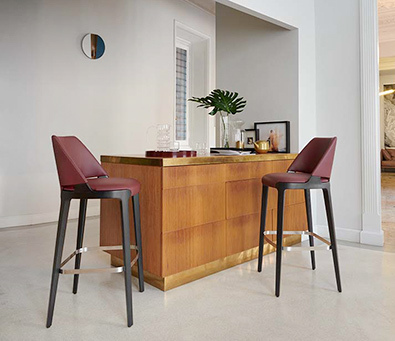 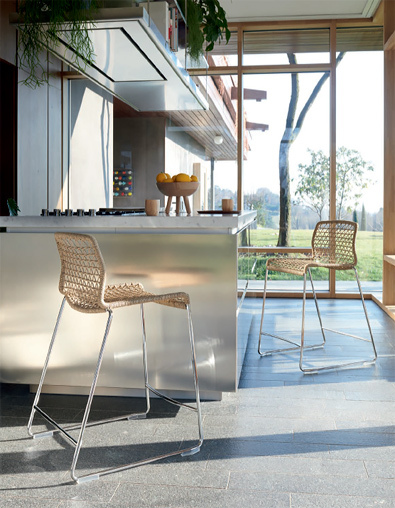 The Bon Ton stool's extra heavy and well proportioned base, combined with it's inverse piston mechanism results in a smooth gliding action and extraordinary stability with no tilting or rocking. 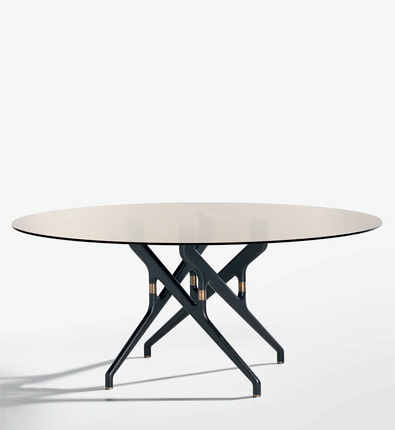 Optional metal finish in bronzed Brass. 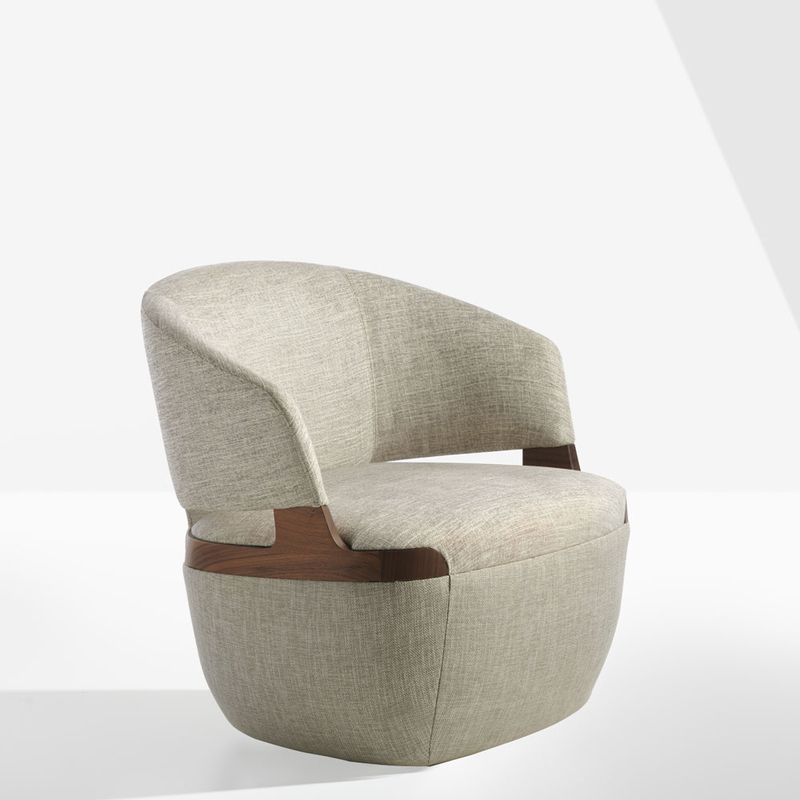 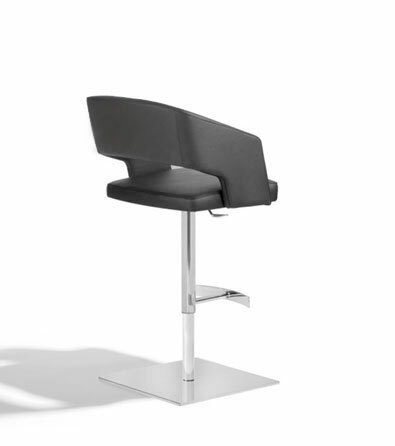 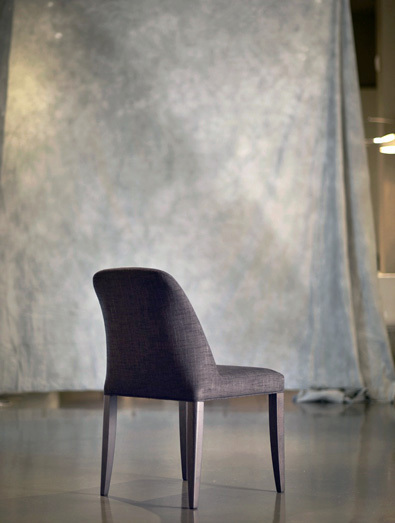 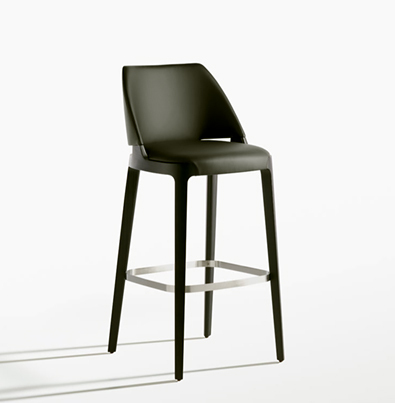 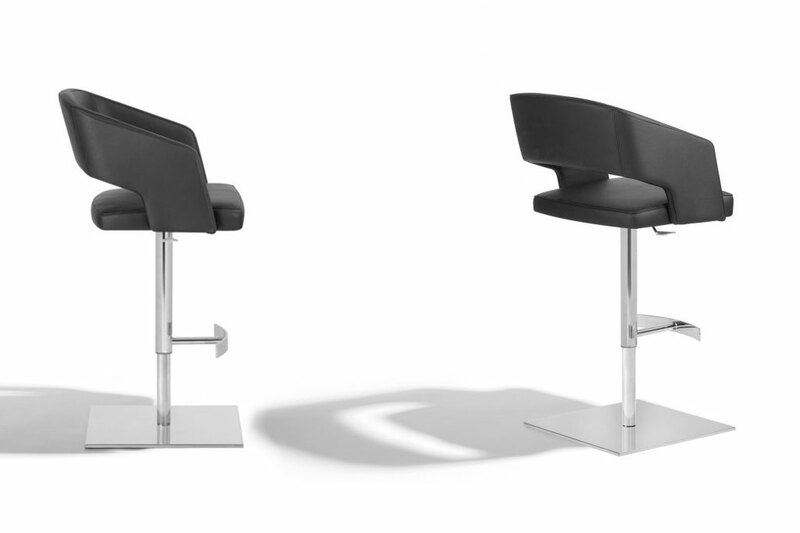 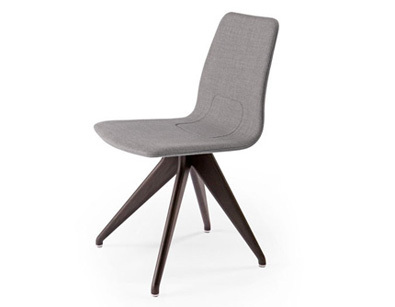 seat height: 21.75" - 32.75"
Design: Alexander Lorenz. 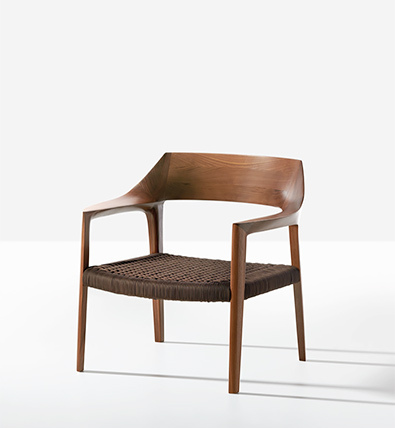 Open back chair in Oak wood, upholstered in fabric or leather. 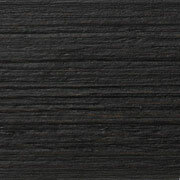 Oak wood available in a variety of stained finishes. 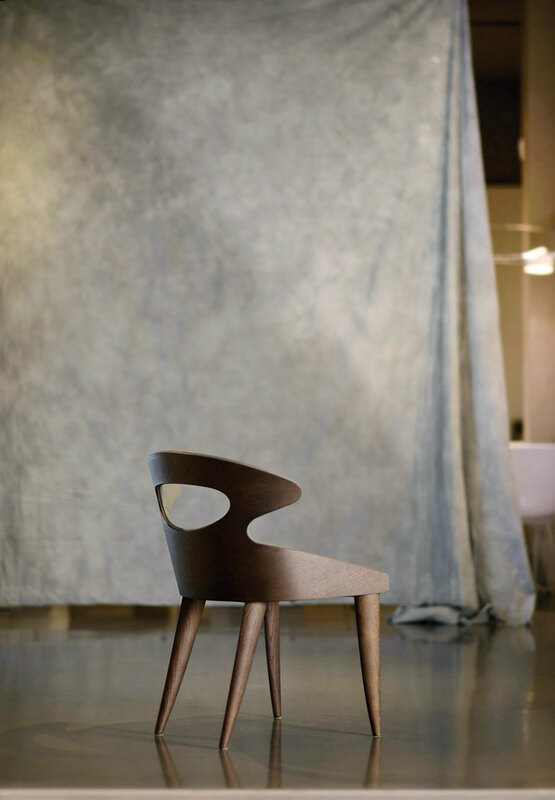 Design: Alexander Lorenz. 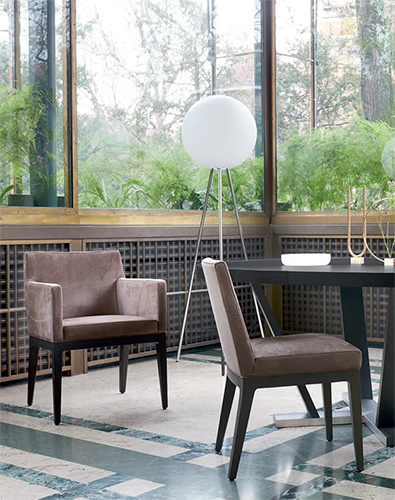 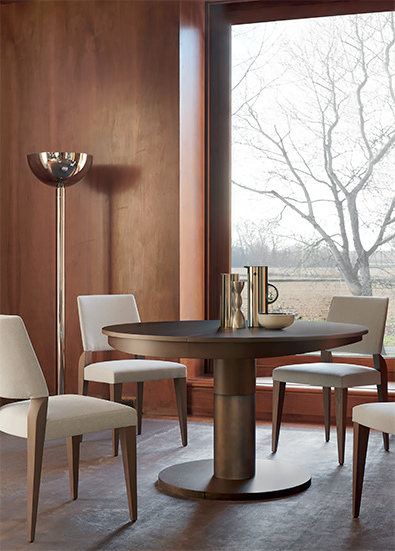 Oval extension table with polished stainless steel or bronzed brass pedestal base. 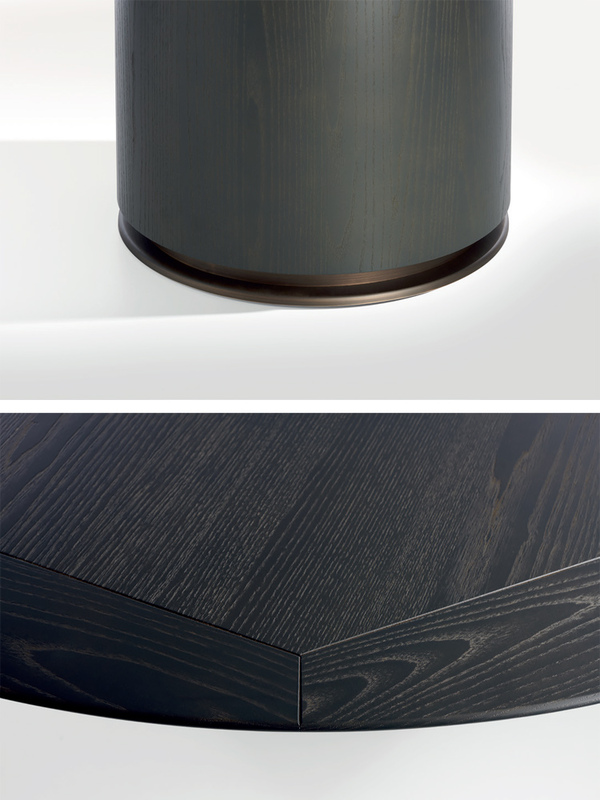 Oak wood top in a variety of finishes. 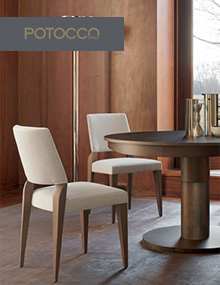 Design: Alexander Lorenz. 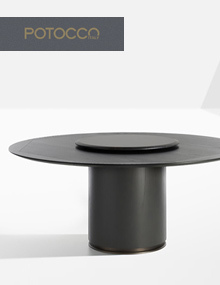 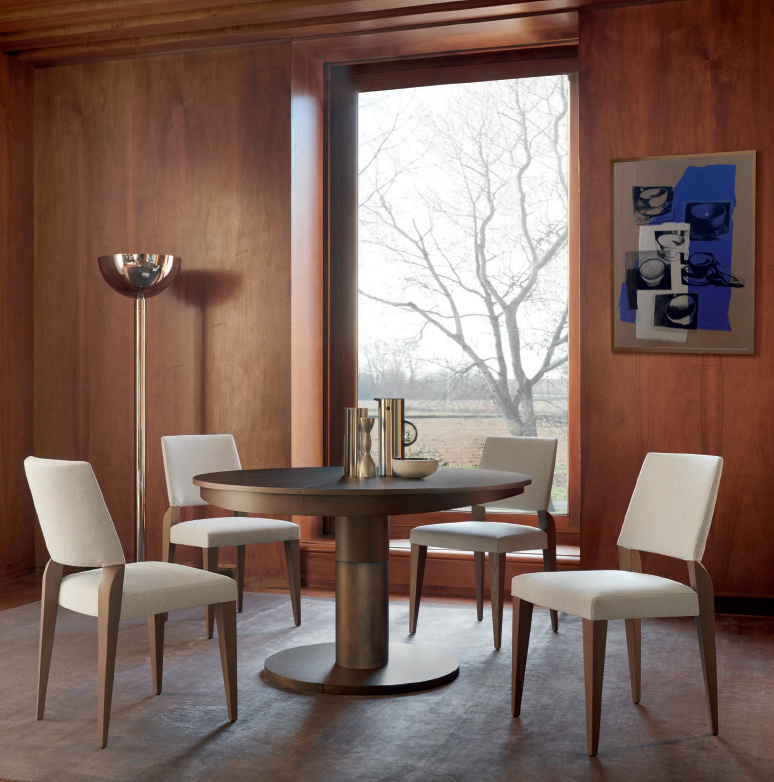 Round extension table with polished stainless steel or bronzed brass pedestal base. Oak wood top in a variety of finishes. 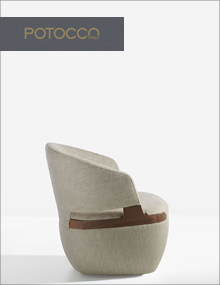 Design: Alexander Lorenz. 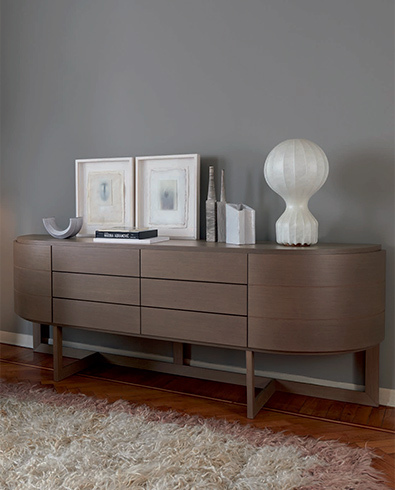 Sideboard with curved profile, 6 drawers, and rounded swing doors on each end. 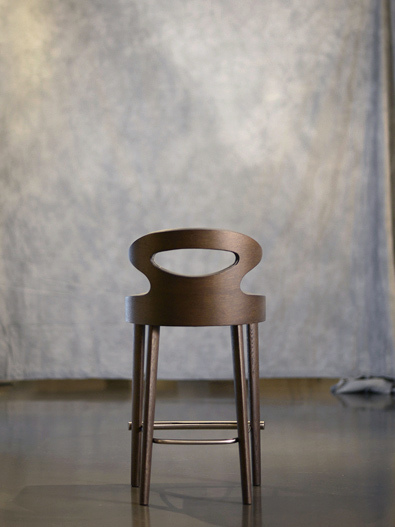 Available in stained Oak in a variety of finishes. 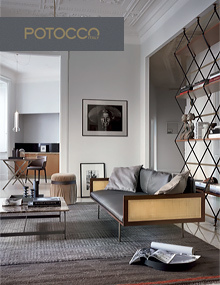 Design: Mauro Lipparini. 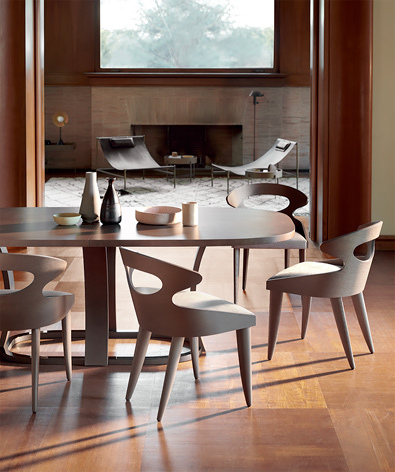 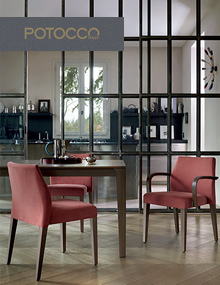 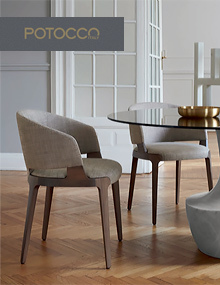 Dining chair with gently curved back, upholstered in fabric or leather, with legs in Ash wood in various stained finishes. 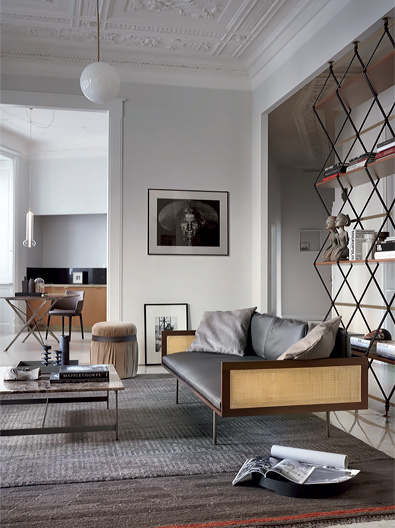 Design: Mauro Lipparini. 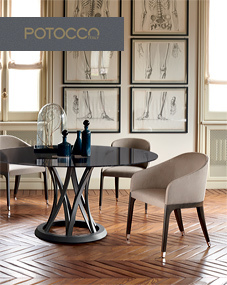 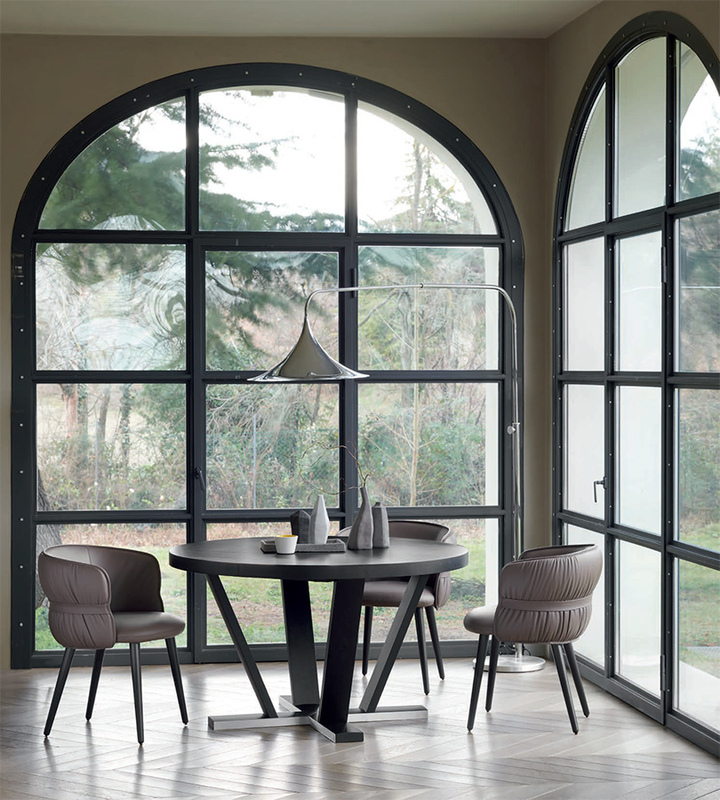 Round extension table with arched pedestal base, in Ash wood in the finishes of the collection. 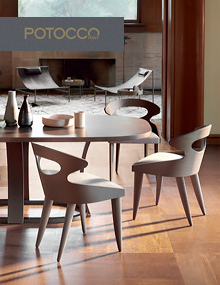 Design: Mauro Lipparini. 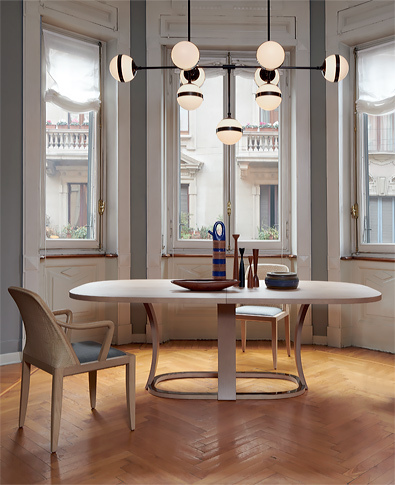 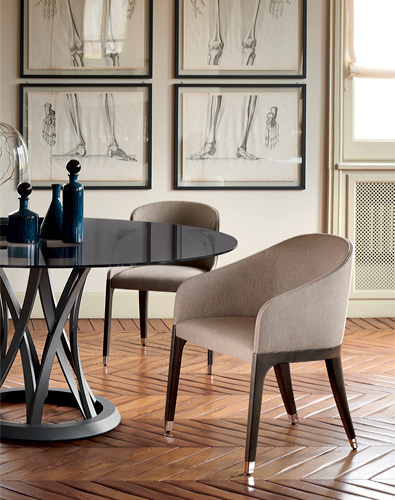 Oval extension table with arched pedestal base, in Ash wood in the finishes of the collection. 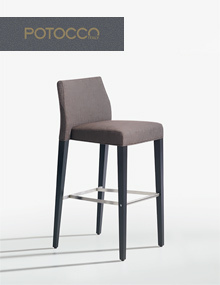 Design: Mauro Lipparini. 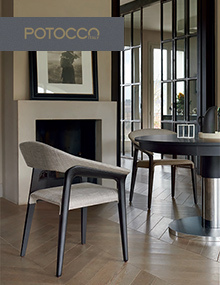 Cane back armchair with upholstered seat and back cushions, base in Ash wood in the finishes of the collection. 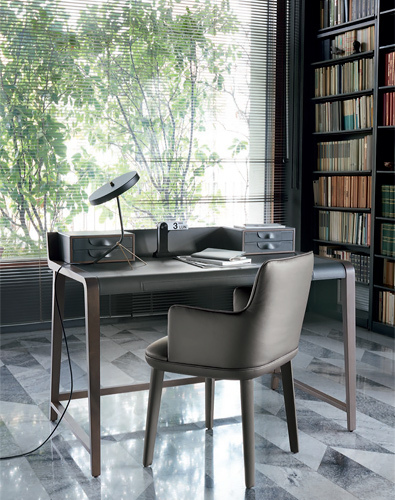 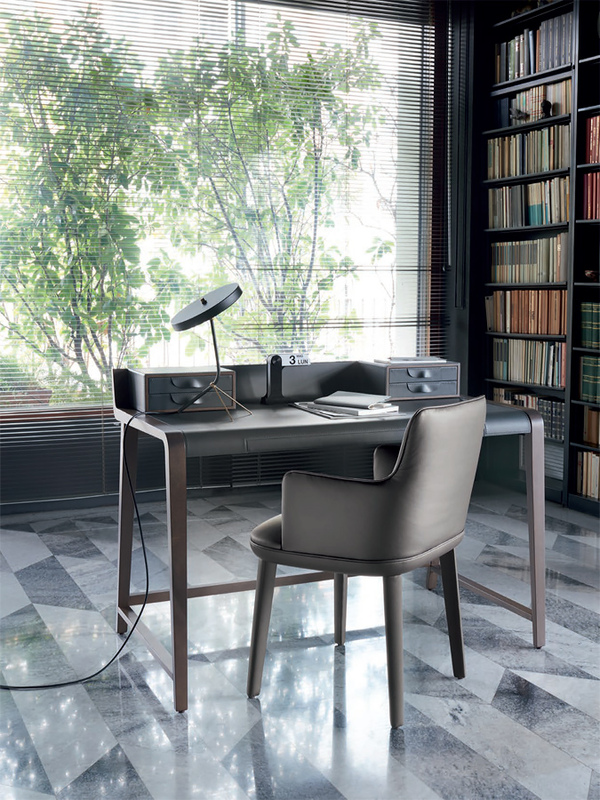 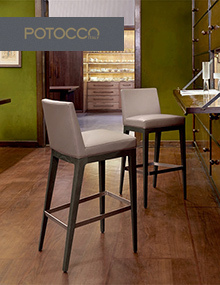 Chair, armchair, bar stool and counter stool in Oak wood, upholstered in fabric or leather. 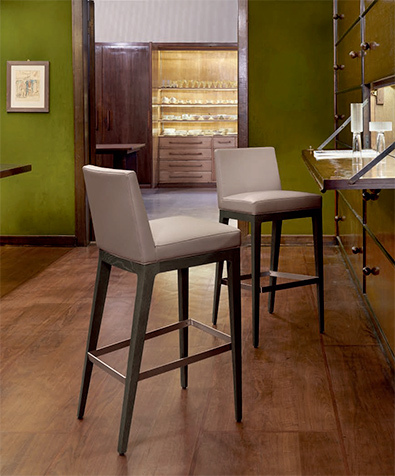 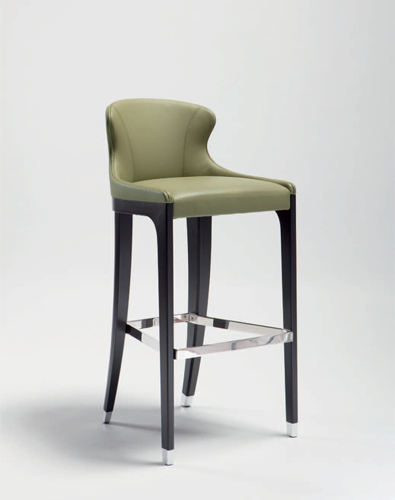 Bar and counter stool in Oak wood, upholstered in fabric or leather. 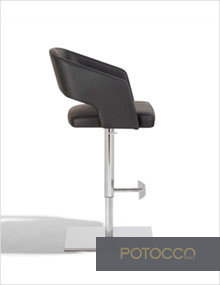 Foot rest in satin stainless steel. 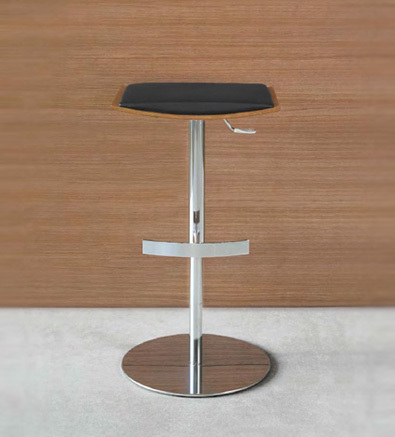 Adjustable height bar stool (gas lift) with seat and back upholstered in fabric or leather, with chromed or bronzed brass stem and footrest, round or square base. 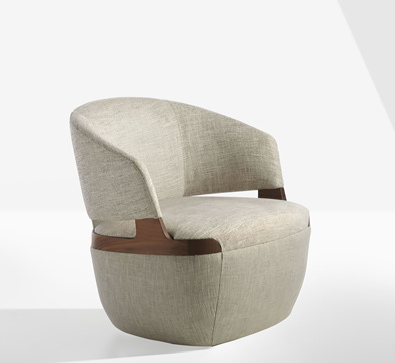 arm height: 29.53" - 39.37"
seat height: 22.44" - 33"
Design: Rodrigo Torres. 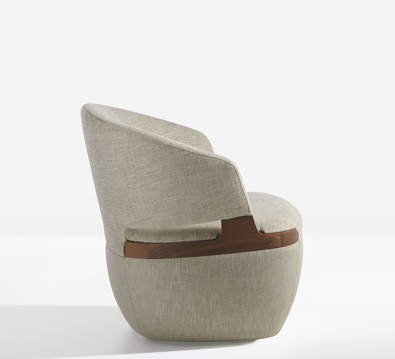 Armchair in solid Ash wood with upholstered seat and back. 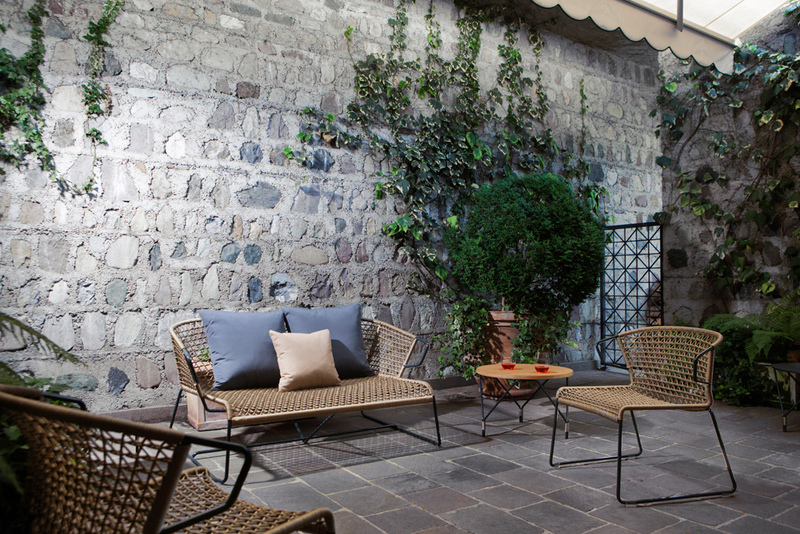 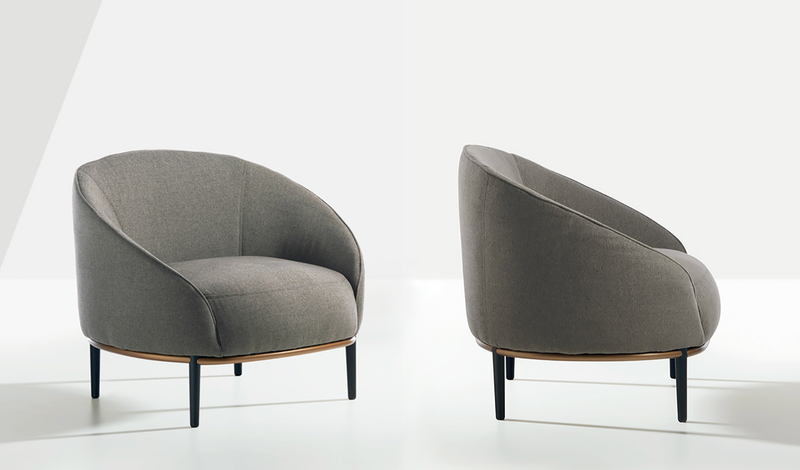 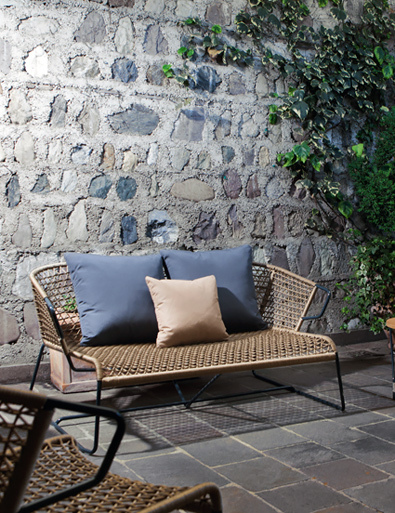 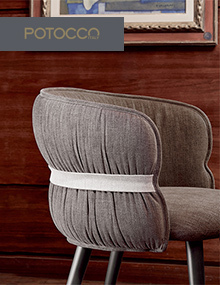 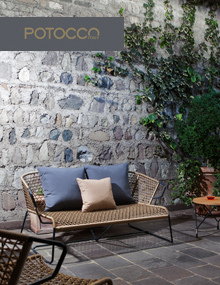 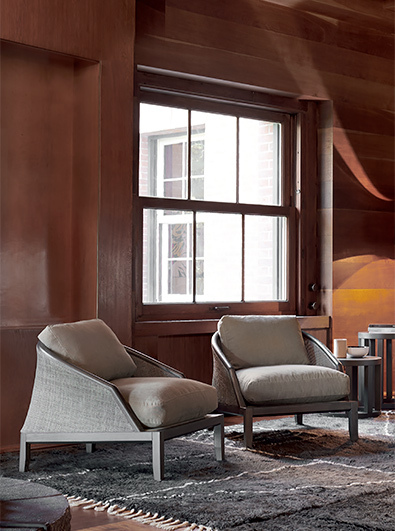 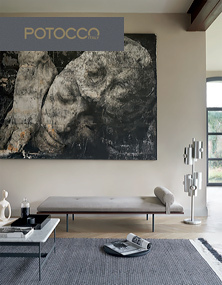 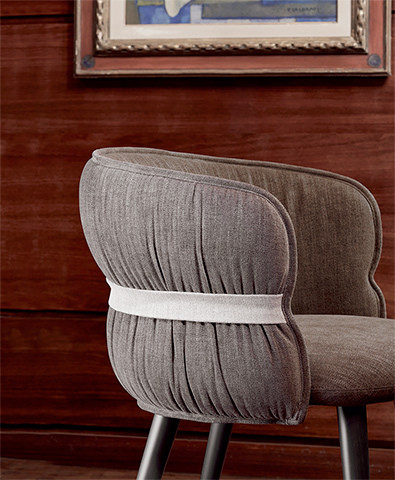 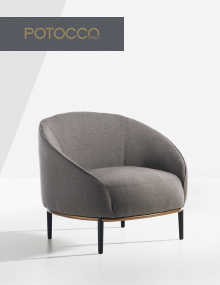 Comfortable armchair fully upholstered in fabric or leather, metal feet tips in chrome, bronzed brass or black chrome. 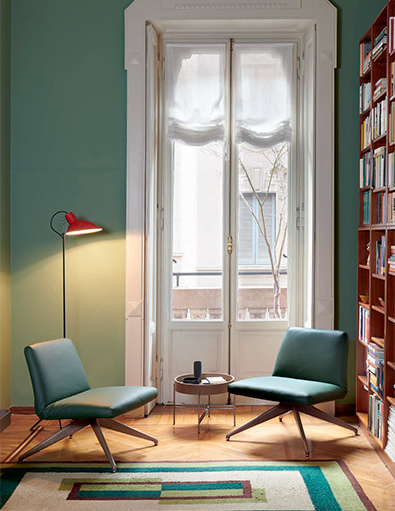 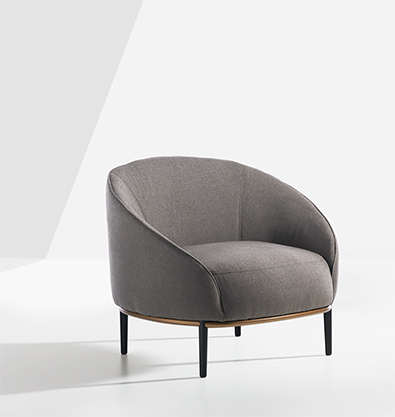 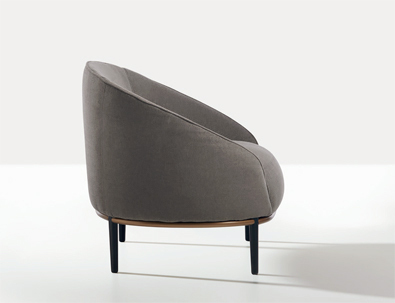 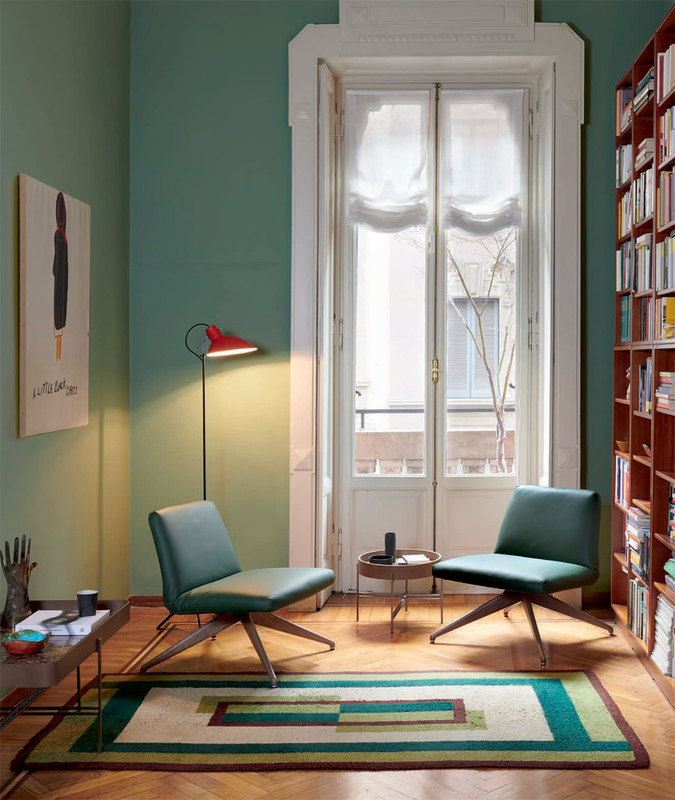 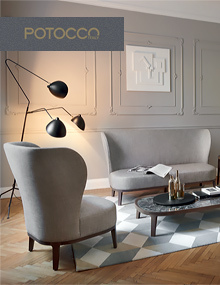 Armchair upholstered in fabric or leather, with wooden legs and seat deck in Beech wood, metal feet tips in chrome, bronzed brass or black chrome. 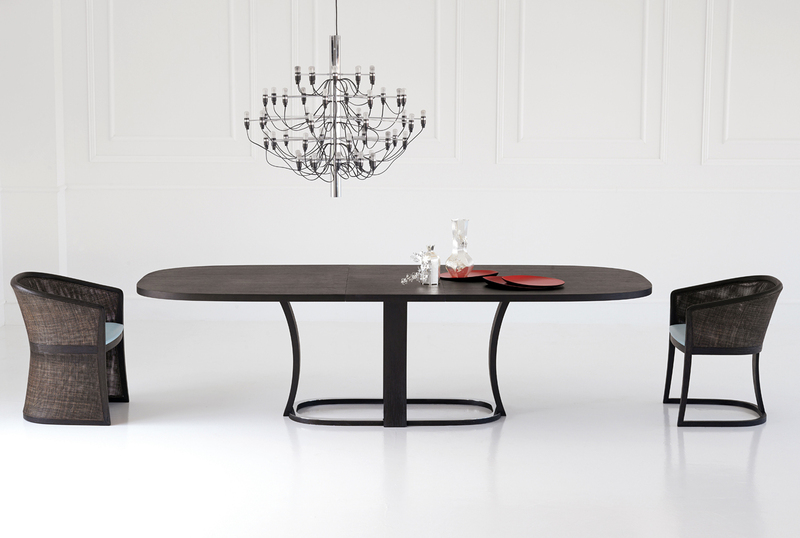 Design: Mauro Lipparini. 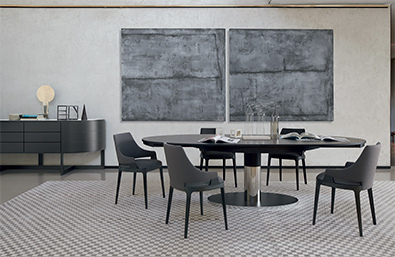 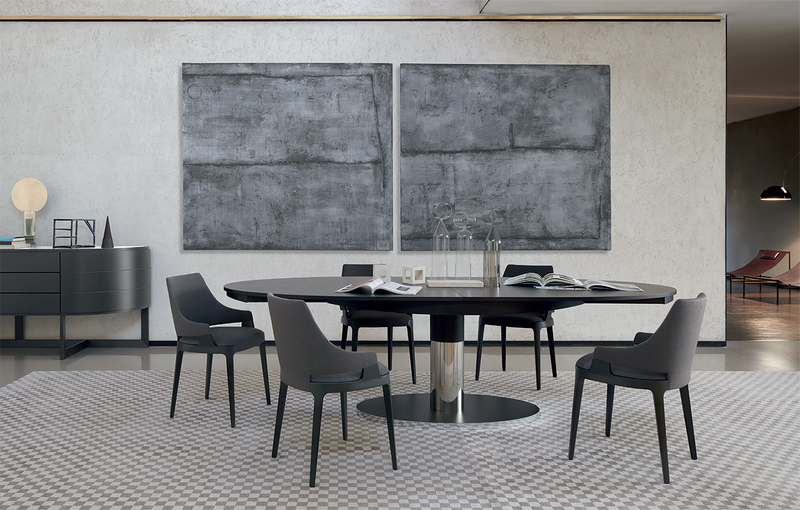 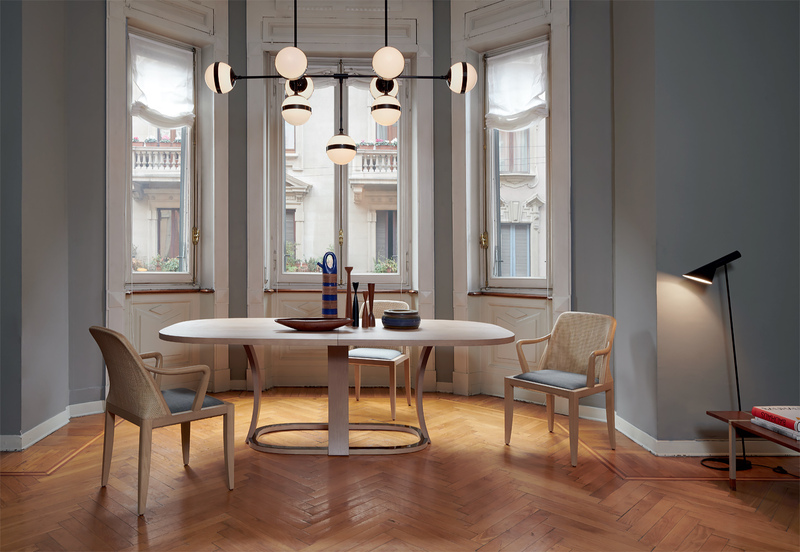 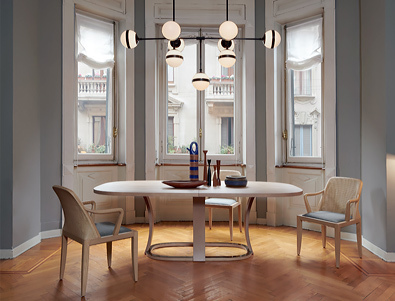 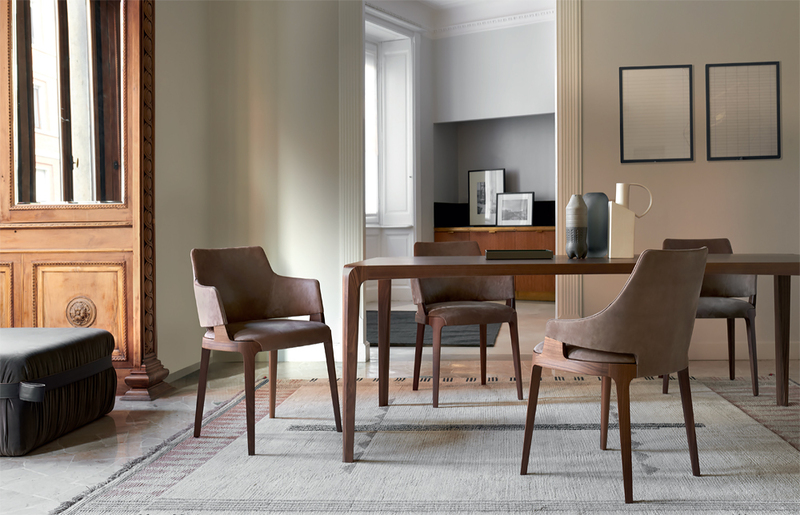 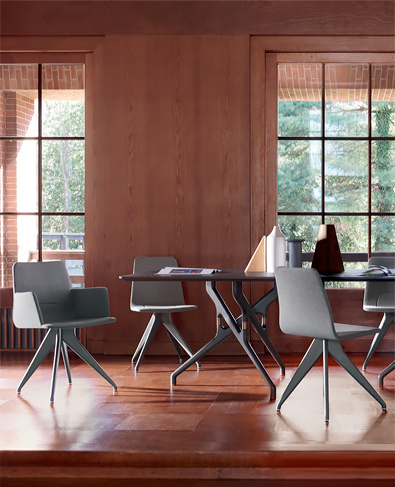 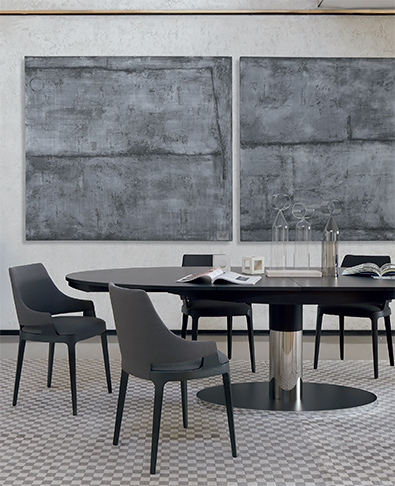 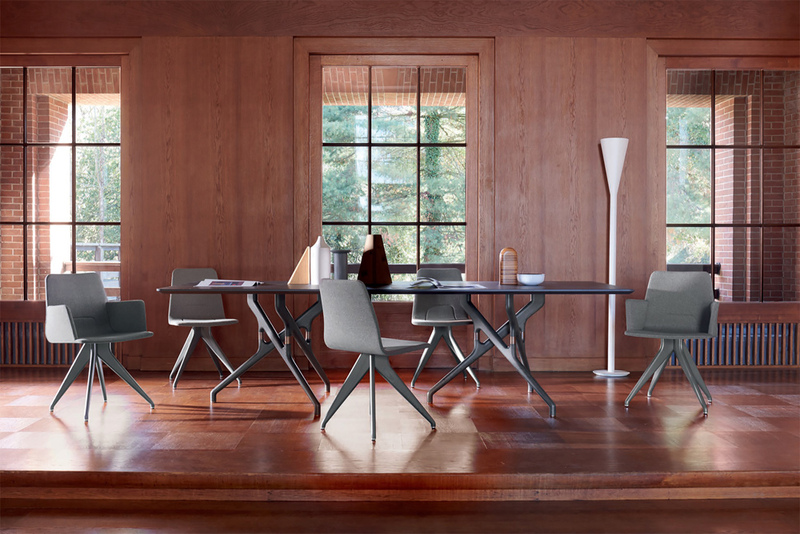 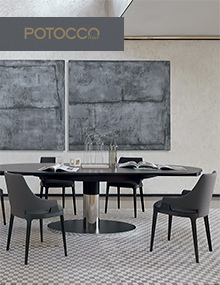 Dining chair with beautifully shaped back in two versions: with completely wooden back and upholstered seat, or with exterior wooden back and upholstered inside back and seat. 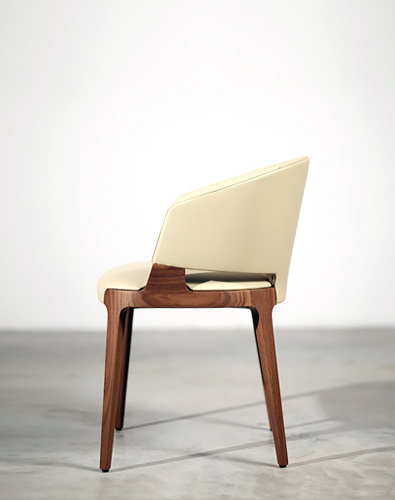 Available in fabric or leather, with frame and back in Oak wood. 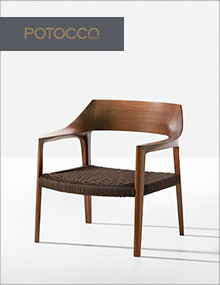 Design: Mauro Lipparini. 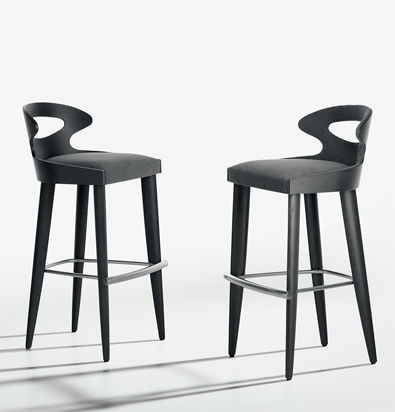 Stools in two versions: with completely wooden back and upholstered seat, or with exterior wooden back and upholstered inside back and seat. 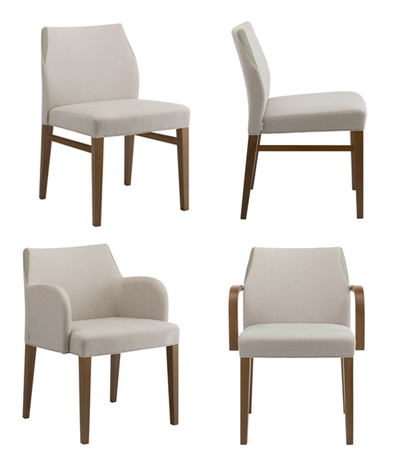 Available in fabric or leather, with frame and back in Oak wood. 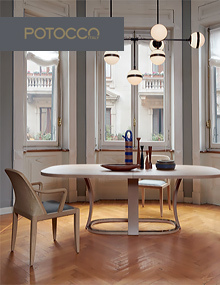 Design: Mauro Lipparini. 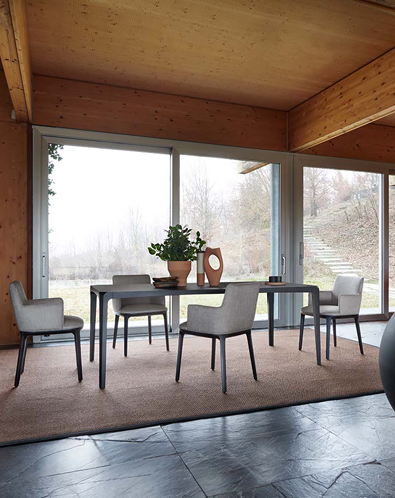 Round tables which can also be used as stools, in Oak wood, with optional seat cushion. 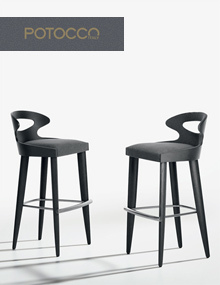 Design: Marco Piva. 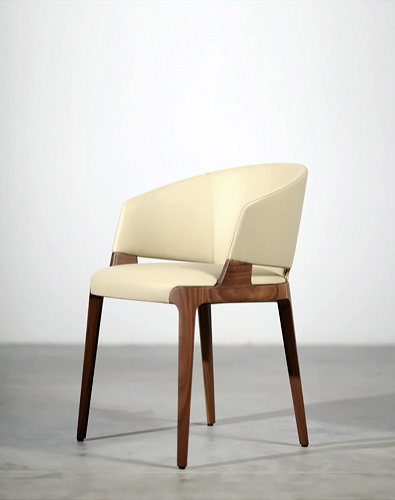 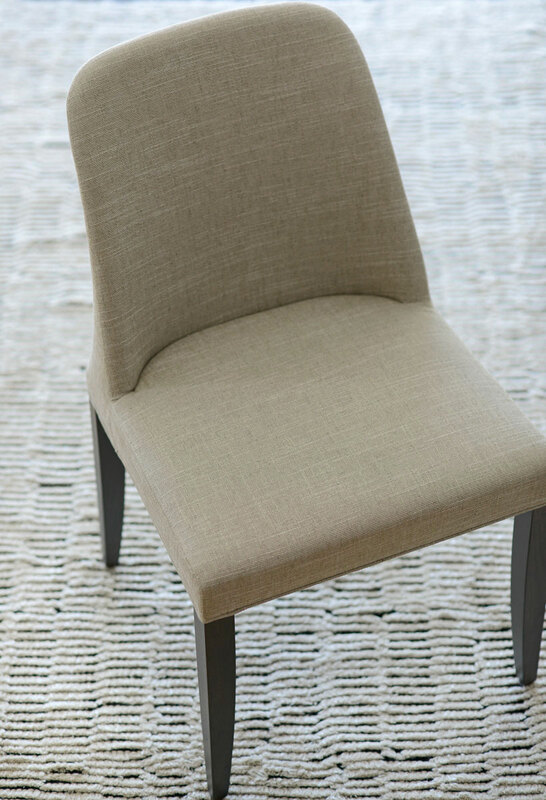 Upholstered chair in Beech wood, in fabric or leather, with optional contrasting fabric detail on the upper seat back corners. 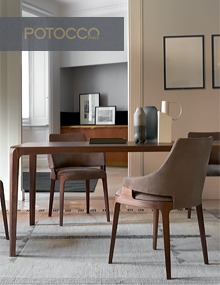 Design: Marco Piva. 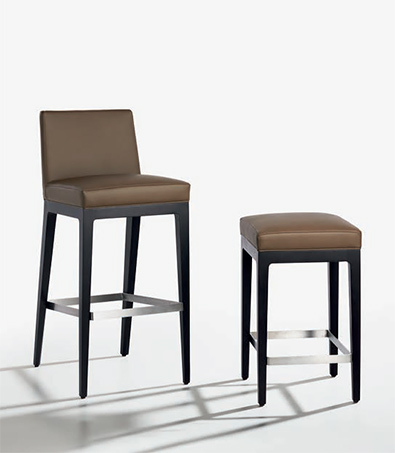 Upholstered stool in Beech wood, in fabric or leather, with optional contrasting fabric detail on the upper seat back corners. 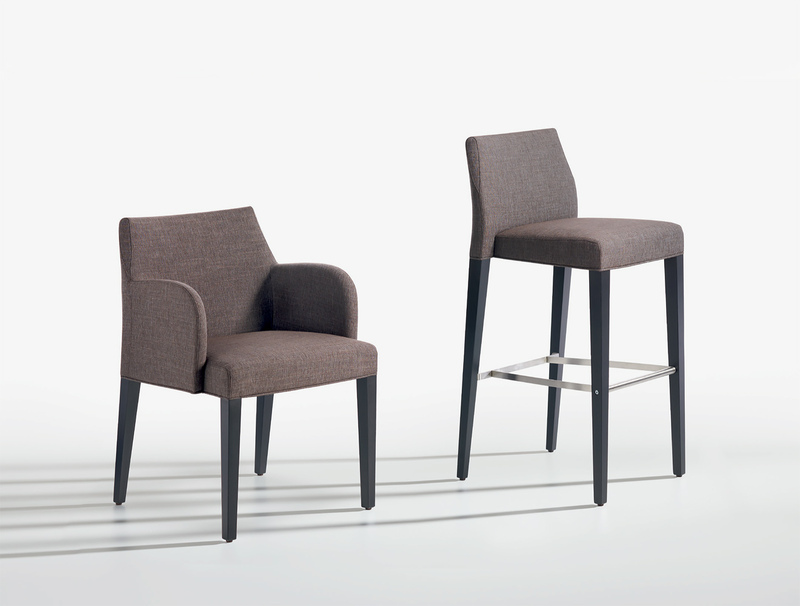 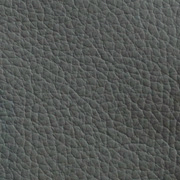 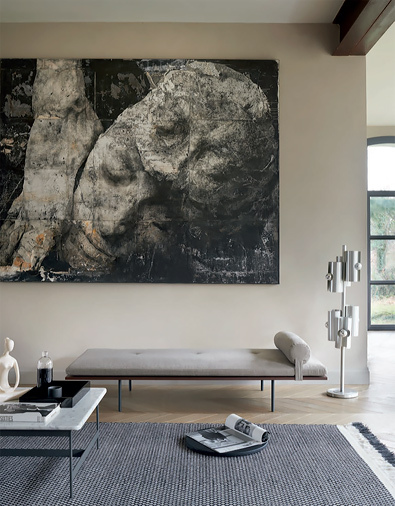 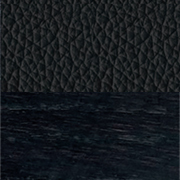 Design: Bernhardt & Vella. 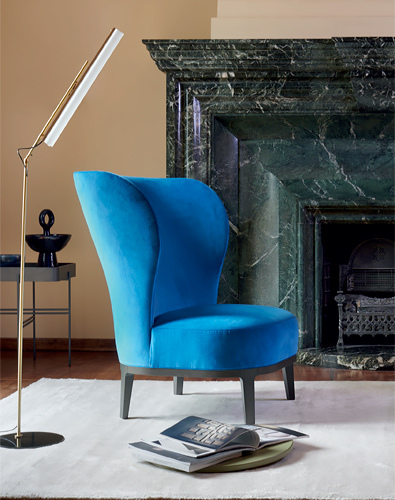 Wing chair and sofa in Beech wood with softly rounded edges and pleasing personality, suitable for home or contract use. 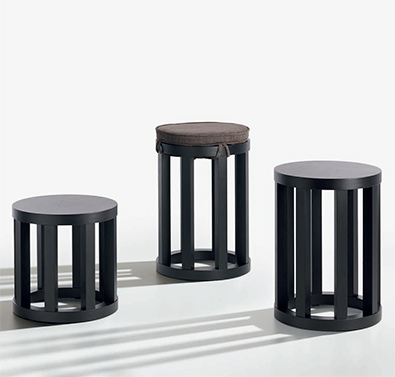 Matching ottoman available. 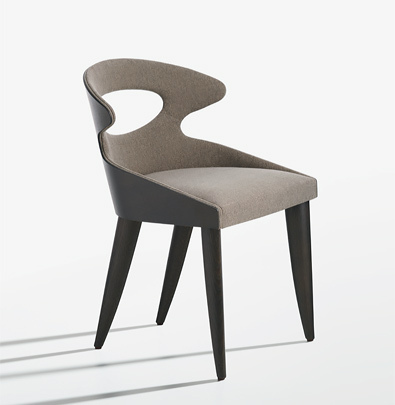 Design: Gianluigi Landoni. Chair and armchair with base in Ash wood, fully upholstered in fabric or leather. 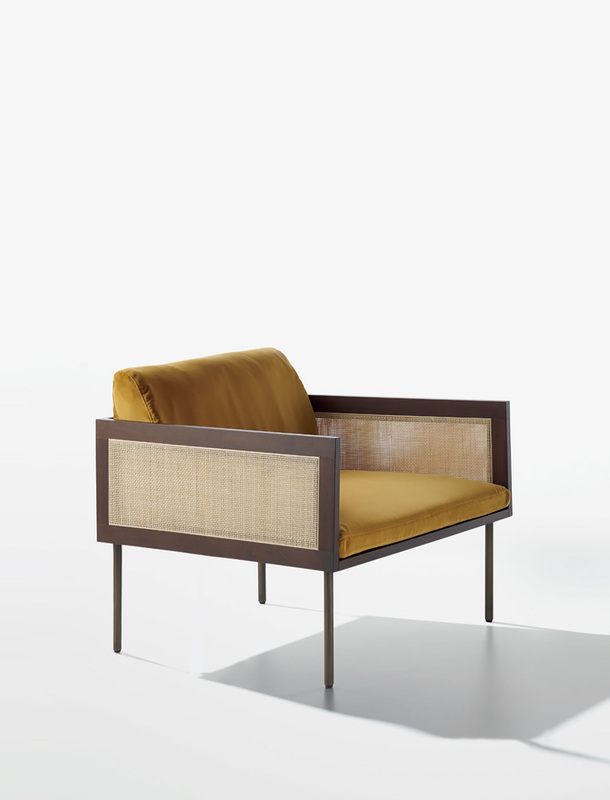 Design: Gianluigi Landoni. 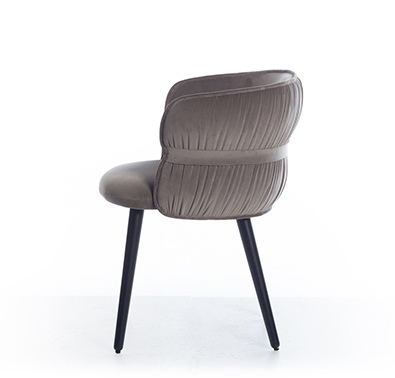 Lounge chair with base in Ash wood, fully upholstered in fabric or leather. 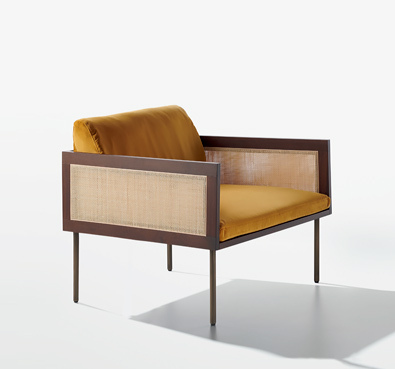 Design: Gianluigi Landoni. 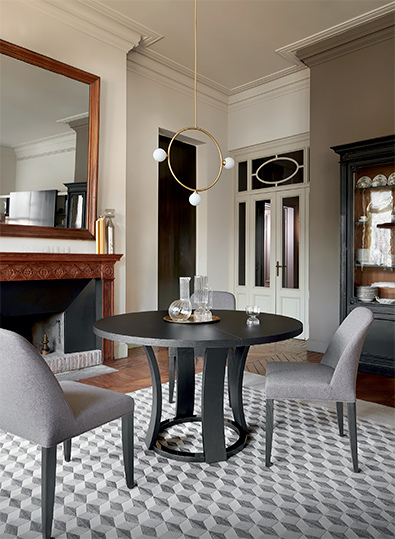 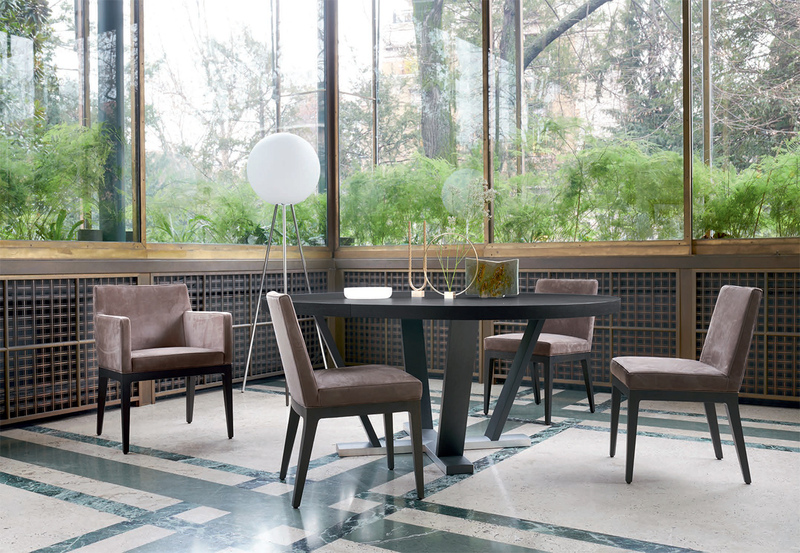 Round table with intricately detailed base in Ash wood with metal accents in glossy aluminum or brushed brass, and tops in clear glass or ash wood. 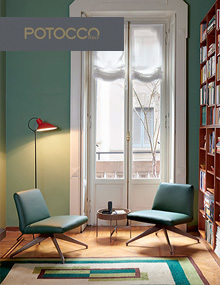 Design: Mauro Lipparini. 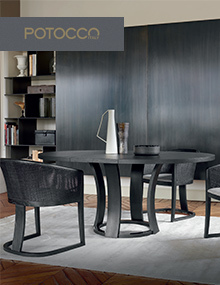 Round table with intricate ash wood pedestal base, and top in clear or bronzed glass. 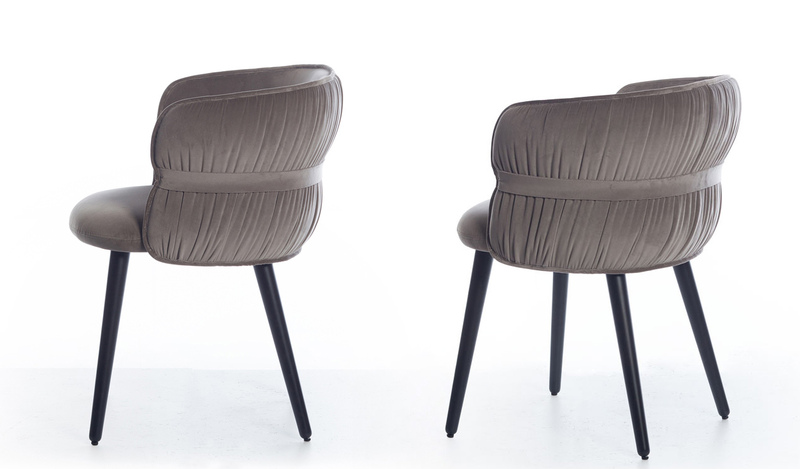 Design: Hannes Wettstein. 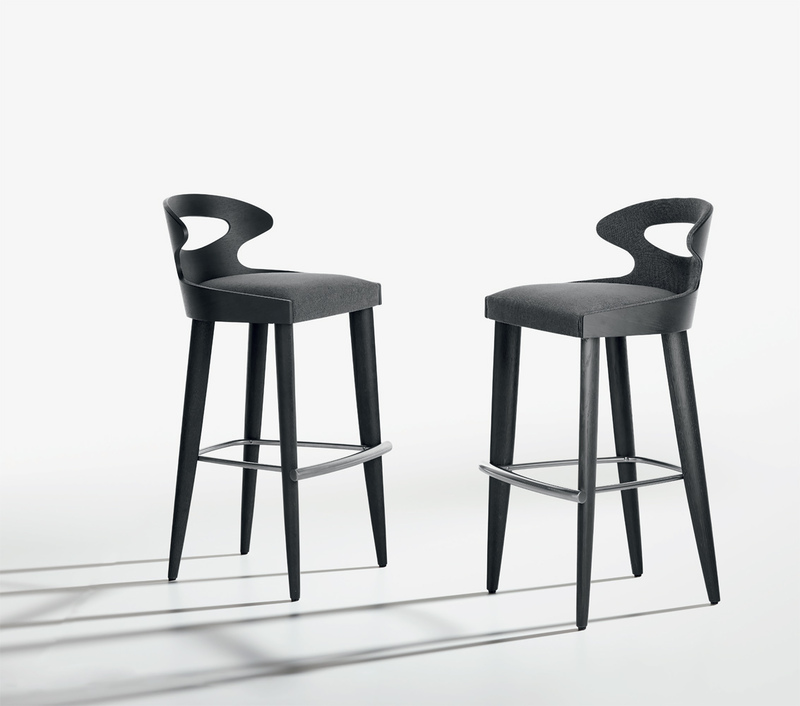 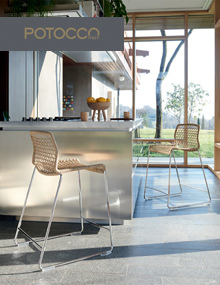 Bar and counter stools in glossy painted steel frame in white with matte white PVC rope, or anthracite frame with anthracite PVC rope, suitable for indoor or outdoor use. 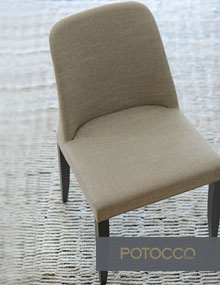 Also in chrome frame with raw rope suitable for indoor use. 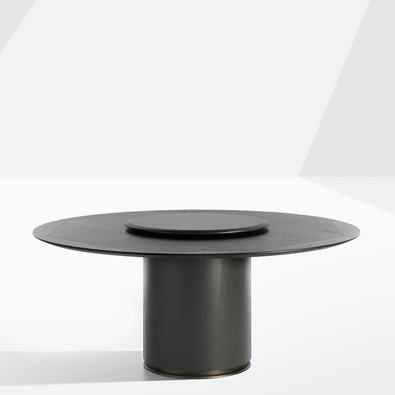 Design: Hannes Wettstein. Stackable chair in glossy painted steel frame in white with matte white PVC rope, or anthracite frame with anthracite PVC rope, suitable for indoor or outdoor use. 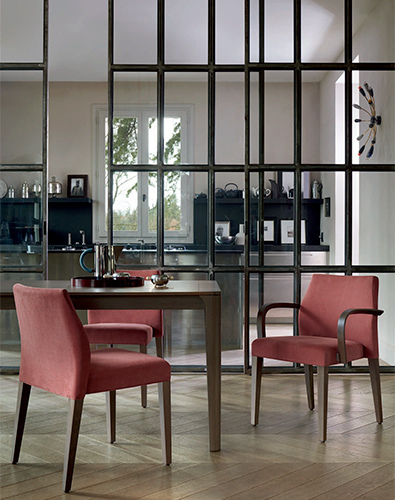 Also in chrome frame with raw rope suitable for indoor use. 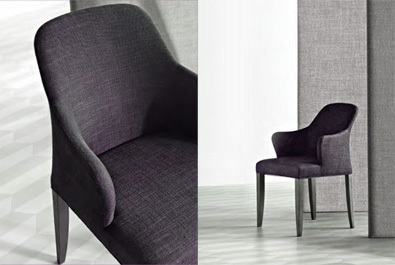 Design: Hannes Wettstein. 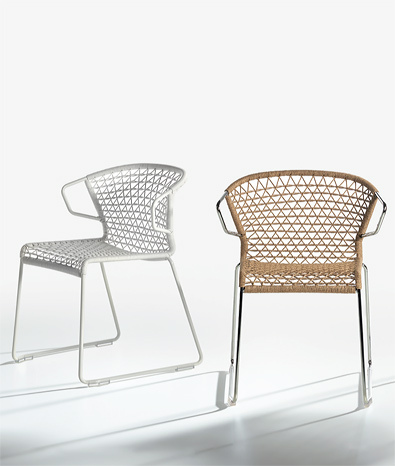 Armchair in glossy painted steel frame in white with matte white PVC rope, or anthracite frame with anthracite PVC rope, suitable for indoor or outdoor use. 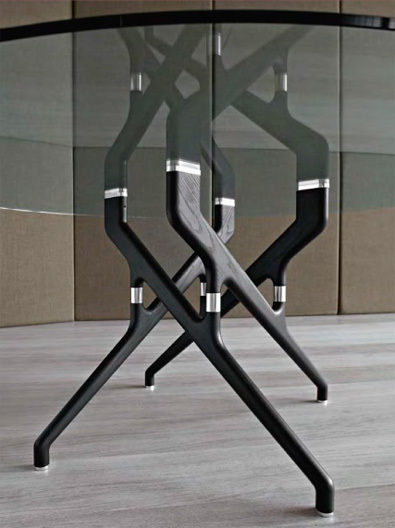 Also in chrome frame with raw rope suitable for indoor use. Design: Hannes Wettstein. 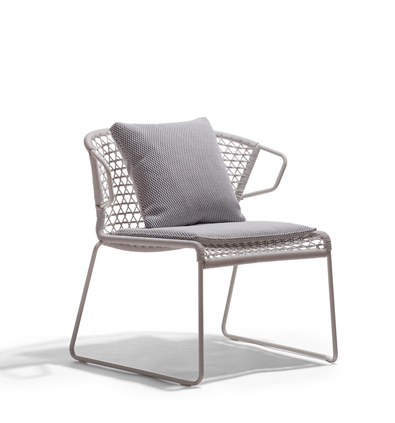 Lounge chair in glossy painted steel frame in white with matte white PVC rope, or anthracite frame with anthracite PVC rope, suitable for indoor or outdoor use. Also in chrome frame with raw rope suitable for indoor use.